'L. burliferum' is native from the Pyrenees in the west to as far as Poland to the east and from central German to as far south as Naples, Italy. Our title photo is of a single flower found growing in the Val Bavona region of Switzerland which is described as being the steepest and rockiest valley in the whole Alpine region. This species will thrive in any garden condition suitable to Asiatic hybrids as it is very forgiving. It will tolerate lime soils. One of the quickest ways to propagate L. bulbiferum is to simply lay flat in a shallow trench in the garden the portion of the stem carrying bulblets. The following season, dig, separate, and replant. Title photo copyright Pontus Wallsten of Switzerland, all rights reserved. Used with permission. Insert photo #1 copyright Dr. Amedej Trnkoczy, all right reserved. Photo taken in East Julian Alps, Slovenia. Source Wikimedia Commons. This image has a Creative Commons Attribution-NonCommercial-ShareAlike 3.0 (CC BY-NC-SA 3.0) license. Insert photo #2 is an excellent example of a highly spotted variant of this species. Photo copyright C T Johansson, all rights reserved. Photo source Wikimedia Commons. This file is licensed under the Creative Commons Attribution-Share Alike 3.0 Unported license. Insert photo #3 shows another variant of "L. bulbiferum', this one totally free of spots. Photo copyright 'Orchi', all rights reserved. Source Wikimedia Commons. This file is licensed under the Creative Commons Attribution-Share Alike 3.0 Unported license. Insert photo #4 taken at Lago di Garda, Monte Baldo, Nago Meadows, Italy. Copyright Leif Stridvall, all rights reserved. Source Wikimedia Commons. This file is licensed under the Creative Commons Attribution-Share Alike 2.5 Generic license. 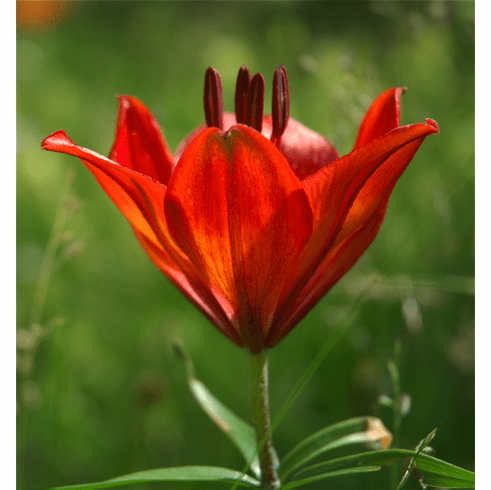 Photo insert #5 from Val Bavona region of Switzerland showing deep red color range of this lily. Copyright Pontus Wallsten of Switzerland, all rights reserved. Used with permission.